I recently learned that someone I know has had an Anna’s Hummingbird visiting. It’s probably more accurate to say that his wife has had an Anna’s Hummingbird visiting, as she is the one who has maintained the feeder since late fall, when the bird apparently first showed up. 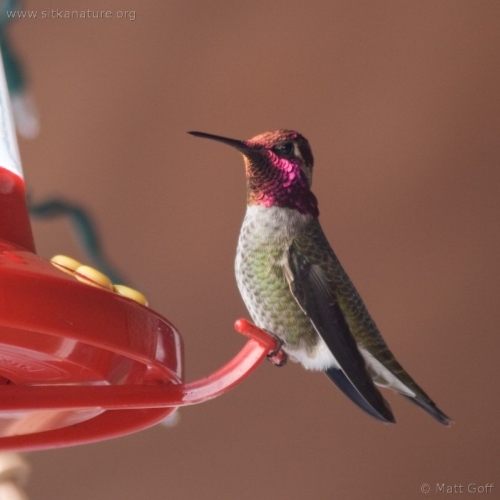 When I first talked to her to get information for inclusion in the quarterly rare bird report, she described the bird as being green and distinctly larger than the normal (Rufous) hummingbirds she sees during the summer. 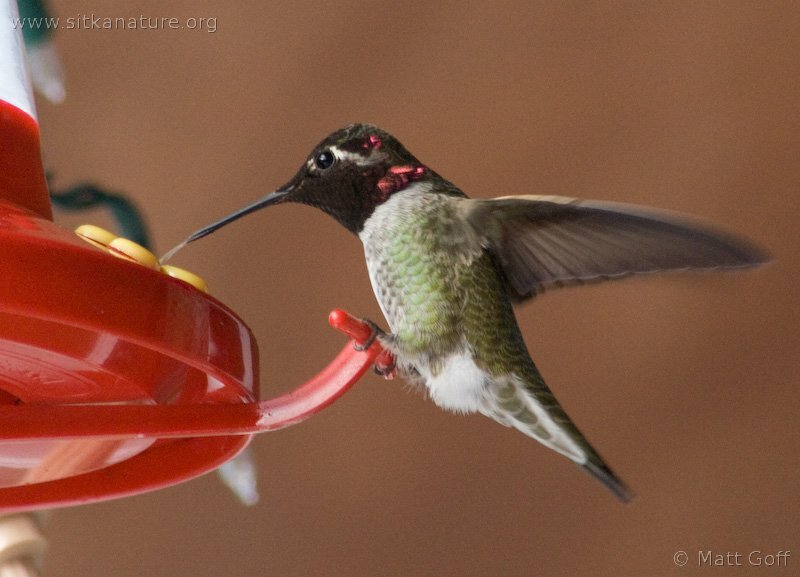 Based on her description and patterns of past vagrancy, it seemed quite likely that it was an Anna’s Hummingbird. Anna’s Hummingbirds are considered Very Rare in Sitka, so I would not generally expect them to be around. According to the Birds of North America account, their breeding range seems to extend no further than southern British Columbia. However, they are early breeders (December-May) and expand their range north through Coastal British Columbia and into Southeast Alaska. Presumably they would normally head back south in August, like the Alaskan breeding Rufous Hummingbirds, but I guess this one went the wrong way and ended up in Sitka. Although the feeder maintainer said she was not comfortable having other people (particularly those she doesn’t know) visit to see the hummingbird, she did offer to let me stop by and try to get some photos to document the bird. I was finally able to stop by last Saturday morning to try for some pictures. I sat and waited outside near the feeder for a few minutes before I heard strange calls that seemed vaguely reminiscent of Rufous Hummingbird calls I have heard in the spring and summer. I went over and looked down from the deck and saw a hummingbird perched in a branch below. It sat there for a few minutes before approaching the feeder. I turned to watch it and it immediately retreated. I felt a little bad about scaring the bird with my sudden movement, so I resolved to not move the next time it approached. I got in a position where I could see the feeder well and waited. A few minutes later it returned to feed. It took a couple of minutes feeding, then flew off again to perch on a branch not far from the deck. Over the hour and a half or so that I watched, about every 10-15 minutes the bird would take a couple of minutes to feed at the feeder before going back to the branches. A couple of things struck me as intersting about this bird (beyond it’s mere presence at this time of year). First, It was quite vocal, regularly chattering between feedings. This seemed a little odd, but then I don’t know the typical behavior of this species. The other thing I did not notice until I looked at the pictures later. The bird never actually stuck its bill down into the feeder. For some reason that’s what I expected it to do, but instead it held its bill away from the feeder and extended its tongue to get its food. I’m grateful to the homeowners who for making an exception for me and letting me stop by and document this unusual Sitka bird. In addition to being an unusual bird for the area, it had some extra interest to me personally as it is the 150th species of bird I have photographed in Sitka (assuming I managed to count things up correctly, anyway). This entry was posted in birds and tagged Alaska, Anna's Hummingbird, Sitka. Bookmark the permalink.